Headed down a half hour west of New Ulm to hunt a new farm outside of Springfield. The harvest reports were showing lots of birds being seen. The farm consists of two areas, one 80 acres and one 100 acres. It was a long drive as we had snow early in the morning and I was also catching the front end of rush hour traffic. We started hunting around 10 am. It was about 15 degrees, light wind, and a few inches of snow on the ground. We parked on the edge of a small wood lot and put the two Setters Marge and Tina on the ground, as soon as we rounded the corner a few birds got up too far out to shoot. A few more flushed long as we hit the end of the wooded area. We started to walk along the fence line towards the other side of the field. We walked the whole side of the field and didn’t move a bird. I was starting to get nervous. Almost as soon as we hit the end and rounded the corner we started to see hens flush long. We walked about 50 yards and got a nice point and put up a rooster. One shot brought him down but he wasn’t hit hard. We spent a fair amount of time looking for him but didn’t find him. There were so many pheasant tracks in the area that it made it hard for the dogs to track. As we moved across the field towards a lower area with some mature trees I could see even more birds flush. I tried to mark their landing areas so that we could walk them up again. After another 100 yards or so Marge went on point and we put up a rooster that didn’t get away and was an easy pick up for the dogs. Moving down the field we got another 8-10 hen points. It was getting so bad that the dogs we starting to creep a little bit. We started to work towards the area that it looked like most of the earlier flushed birds had landed. We got a few more points but they were all hens. I decided to re-walk the area where we hit the bird that we lost and see if somehow we would find him hiding. We didn’t move any birds on the second pass through. We started to work our way back to the truck with the idea of hitting the second field. As we walked Tina started to point and move, point and move. I figured that she was just starting to overdose on all of the scent and tracks. When she finally did lock up I was only half heartedly kicking at the grass when a rooster came up fast and furious. Fortunately I hadn’t totally spaced out and was able to solidly plant on shot on him. We continued back to the truck and along the edge of the wood lot the girls pushed another rooster up and we were able to also bag him. Back at the truck I loaded Tina and Marge into their kennels for a well deserved rest. I swapped out the 12 gauge for the 16 and Fergie out of her kennel for some exercise. Even though we had out three bird limit I still carry a gun in case we come across a wayward Hun or a Raccoon gets in the way. We put up another 7 or 8 hens right away and worked the area of the field that bordered the road. As we got towards the end of this area I started to see a lot of rabbit tracks and was actually thinking that it was odd to see all of those tracks and not be pushing any rabbits along. Just then I looked up one of the wheel tracks through the snow and a rabbit was sitting there. I decided to take him. Normally wouldn’t shoot a rabbit because I don’t want to have the dogs think we are hunting them, they like following them too much as it is. But, Fergie is blind and it wouldn’t mess her up at all. Plus I have kind of thought of taking a rabbit since I had one as part of a wild game stew at a restaurant in Quebec, also Minnesota Outdoors News had just the day before had an article on rabbit hunting and how to prepare them. On the way back to the truck Fergie had a really nice point on a hen so that was a great bonus to see her so excited by that. Just under three hours of hunting and we got our three birds plus a bonus bunny. We had more than 15 points and saw well over 50 birds. It was a good day to hit a new location. Before hand I wasn’t sure how this day’s hunt would go. Some parts were looking good. It was supposed to be up to 40 degrees for a high. There was some fresh snow on the ground and I was taking a buddy with who would be running his GSP. On the negative side I had hunted this farm the previous weekend and had only seen 2 roosters and gotten just one. In looking at the harvest reports it wasn’t looking as if anyone else was seeing many more birds. There was also a storm due to hit that night or the next morning. We started by walking the east side of the unit that bordered a plowed under field. No luck there. We turned right and worked along the swampy wet area that will usually hold a few birds. Again nothing. I was getting concerned that it was going to be another thin day. We moved over to the south side of the cover and walked the edge of the field. This edge borders a field that was the last one in the area to have the corn taken off of it. The were lots of tracks along the edge, but we had seen tracks all over already and hadn’t seen any birds. As we got closer to the end of the field the dogs started to get really birdy and were stopping and going. A couple of hens broke and finally a rooster got up and I was able to hit it and bring it down. While Stone, the GSP, was retrieving the bird a few more broke long and we watched where they flew to. We split up a little bit and I sent my buddy, Tony, towards another thicker area that usually holds a bird or two. It was also an area that a few of the flushed birds flew towards. If nothing else we figured he would get some hen points. I followed Tina towards some thinner cover as she seemed to be working some scent. We worked for a fair amount of time with her pointing soft a few times and finely she locked up hard. I walked in and kicked up another rooster. It looked like I hit him on the first shot but he was still flying so I tossed out two more at him. He climbed and flew towards the farm house, over the house, over a barn, and over a tall set of trees. To me it looked like he then took a hard turn left and landed. Tony said that from his vantage it looked like he just fell from the sky. We started to work around the edge of the farmyard to see if we could find him. Going around was going to be a long walk. As we worked through the thick cover the dogs were able to point another hen and we saw another rooster flush wild so we marked him down. We made it around the farmyard and stared to look around and there in the snow was the rooster just lying there. We headed along the edge of the cattails hoping to put another one up. We did see one break from the cattails and fly across the thick cover and looked like he landed by the edge of the dirt road. I took Tina and Marge towards the far corner and Tony went to a near corner with the goal to trap the rooster between us. I hadn’t even made it half way back when I heard Stone’s beeper collar start to chirp. I saw Tony walk in, the bird flush, the bird fall, and then I heard the sound of the shot. It was kind of cool. We moved back to the edge of the cattails and worked the rest of the side. No points no flushes. We cut across the frozen pond and started to follow the dogs to the other side to try to find the wild flush from before. Marge and Tina went on point almost right away. I started to kick around and a hen came up. Just as I let my guard down rooster also flushed. I thought I hit him hard as he went down pretty hard. I walked over to pick him up as Tina was pointing him in the snow. As I picked him up I could tell he wasn’t hit too hard and was surprised that he hadn’t run. Tony slid him into my game vest and we continued down the cattail edge following the dogs. I wasn’t too hopeful as I had never gotten a bird in this area before and had just gotten one. 100 yards later the two Setters went on point again and another rooster got up and another easy shot put him in the bag. 50 more yards and the scene was repeated again. 2 hours and we had our six bird limit. I felt bad because I kept sending Tony towards the areas that I have had good luck before but I was the one getting the shots. We’ve hunted together long enough that the other guy doesn’t get too worked up when it happens this way because we know that the next time it could work out the opposite way. It ended up being one of those days where things just work out well. The dogs listened and the birds cooperated. I think that the birds were on the move and were eating heavily in anticipation of the incoming storm that was predicted. Sunday it was snowing too hard to make it worth risking the drive. It is looking like we are having a real winter in MN this year. So, I had planned on taking Friday off and making it a full weekend of hunting. The time and temps on the banks were saying 5 above as I was driving out to start the day just South of Hutchinson, MN. I even decide to put in the fleece liner in my Columbia Ptarmigan hunting jacket ( an older model ). Tina, Marge and I got off to a good start by pushing the unit towards the of the field. We didn’t move any birds at the corner this time. We worked around the small wetland with heavy cover and still no birds, not even a wild flush. I was starting to worry. We then worked along the plowed cornfield moving towards the highway. The dogs were working through the pine trees and brush that border the field. After about 100 yards they both locked up, I swung wide past them and approached the points from the cut field. My thinking was that if I did miss at least the bird would flush towards the property and we could attempt to hunt it after it did land. I didn’t miss. It was a decent shot and the dogs were on it right away. We worked the unit for another hour plus hitting all of the usual hot spots. Only saw one hen during the rest of the hunt on the unit. It is starting to seem like it may be played out for the season. Loaded up the dogs and headed west towards Sacred Heart, MN I took Fergie out at the next location. The next three units are all by each other and can be walked to from one parking spot. The two units that hunted Fergie on were 25 and 35 acres. On the 25 acre unit we put up 4 hens that we pushed off of the edge. It would have been nice to get her a Rooster. We put a fair amount of time into the 35 acres and didn’t move anything. On returning to the Trailblazer I kenneled Fergie and brought out Tina. The third unit was a little bigger and we did get 2 nice hen points but no Roosters. Loaded back up again and drove 5 miles to another unit. This one is about 40 acres. Tina and I worked a set of pine trees that usually holds birds but none were to be found this time. I did see one flush wild towards a good sized cattail area. We angled towards the area that he looked like he landed. Tina ended up going in one area and I cut in a little ways away. There is a path cut through the cover and Tina and I were working towards each other. I happened to look down the path and could see the Rooster looking towards Tina as she was approaching. I took another step and it flushed. I was able to connect on the shot and we had to do some digging around the cover but were were able to find it. We continued to work the unit and hit a second set of trees and had a number of birds flush long on us. We watched where they landed and worked that way hoping to get lucky again. it wasn’t to be. The next spot was a bit of a drive up to Benson area. The temp was up to 20 degrees This is a bigger unit and from the harvest reports always seems to hold birds. It was just my second time ever hunting here. We only had about 90 minutes of daylight left. There is a area of larger trees and Tina, Marge and I started towards them. We had a number of birds flush long on us with no shots taken. A short ways later I did get a shot at one that the dogs had been working. It looked like he was hit but he was flying strong. He ended up doing the fly straight up in the sky and spiral down. Unfortunately he landed in some 10 foot high cover and we looked quite a while but still couldn’t find him. I hate losing birds, just seems like a waste. We worked along the the tree line and had more wild flushes. After another 15 minutes we pushed through the trees and the dogs both went on point. I was able to bring this one down and we went right to where i had him marked. He tried to make a break for it but Tina got on him and we were able to put him in the game bag. Our first Minnesota 3 bird Pheasant limit. After cleaning the birds we started to make the drive home. As we were pulling out of the field the snow started to fall. The drive that was normally 3.5 hrs was closer to 5 hours. Left the house at 7 and got home at 9:30. A long day of hunting and driving but well worth it. Innotek is pretty much out of the sporting dog business and concentrating on their inground fence deal. I am running a 1600 track and train and have been for the past 10+ years. At first I had a fair amount of problems but after a couple of years they upgraded the products and I have had good luck with them. This past weekend I did have one of the tracking collars lose the tracking function. It wouldn't even make a noise when I turned the unit on. I called the 800 number hoping for some assistance but not really hoping for much. The took my call right away, confirmed that it wasn’t working correctly. Shipped my a new unit for $50. I got the unit in three days. When it arrived I needed help resetting the beeper tone options. Another call to customer support and they helped me out right away. I’m bummed that they are leaving the business. At least I now have a new collar that should last a while. I usually am running two dogs and two collars at a time so they see a fair amount of use. With family in town I was able to get out every other day. Started out south of Hutchinson. We got a late start and it still seemed cold. We pushed a tree line towards the end of the CRP area. When we got towards the end the two dogs split up and I followed Tina as she seemed like she was going hotter. She ended up pulling off of the scent and head back towards the tree line. I started to work towards Marge as she had gone on point. I was still a ways away two Roosters took off from the corner and flew into heavy cover off of the property. Worked around to the other side of the willows and was able to put one up out of there. It was a pretty easy shot and I didn’t miss this time. While I was picking up the one I got the dogs put up another one. By the time I could decide if I should drop the one in my hand or shoot while holding it the flushed bird was a ways out and I missed. We spent about 2 hrs on this unit today. Drove west to by Montevideo to hunt another unit. 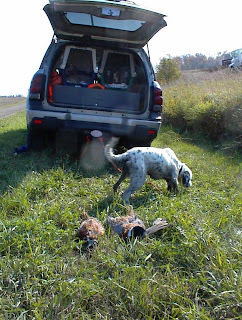 After pushing one section of CRP towards the road the dogs went on point and I was able to put up a Rooster. He got up pretty close but I wasn’t able to put him down. I looked for him for a fair amount of time but we didn’t find any trace. We did move 8 does on this unit. The unit borders a WMA so I am sure they pushed right off of it. We worked out way around to some more of the CRP cover and got another point after about another 2 minutes of work. This time I was able to get a good hit. He still was able to bury himself in the cover before Tina went after him and caught him. Today was a lot of walking. The weather was nice so it wasn’t too bad. Started out south of Hutchinson. Worked my normal route and didn’t see anything. We were pushed one small set of cattails out towards some thinner cover and we were able to put up a nice Rooster and put him in the game bag. We kept working the area and saw 3 hens but no Roosters. Took Fergie to a spot west of Hutchinson and worked her on a unit that had not been hunted that day. We put a few hens but no Roosters. It was fun to see her works some fresh scent. She usually has to hunt some spots that have been hit hard by us already that day. Tried a new spot that is North of Hutchinson that has a lot of good looking cover. Ended up seeing 4 Roosters but they all got up quite a ways away and flew into the middle of a large cattail swamp. If it would have been a smaller area I would have gone after them. Ended up going back to the first spot and trying to get a bird that was coming into the cover to rest for the night. We moved a few hens but no Roosters. 6 hours of walking but it was worth it and the dogs were tired. I worked the unit 3 different times in the day and didn’t see any Roosters UNTIL..
We were coming back towards the truck past an area that had been covered at least 5 times already and sure enough while I am day dreaming about fishing a Rooster gets up nice and close to us. By the time I woke up he was flying past my truck.. past the house across the road.. finally in the clear and he was a little ways away and I didn’t bring him down. 4.5 hrs of walking and my best chance is right at the end and I blow it. Just served to remind me to finish out the hunt and to watch my dogs all of the time. November 22/23 An easy weekend. I hunted a unit south of Hutchinson. 90 acres of CRP and wetlands. I was lucky enough to hunt this unit the first weekend after they had taken the corn out of the field next to it. On Saturday I was able to get my two bird limit in 30 minutes and on Sunday it took me 40 minutes. I kept working the dogs afterwards to get them some more exercise. Felt lucky to have gotten the birds I did because we didn’t see any others in the next hour of work. On each of the days I missed at least one easy shot. I’m finding that I am doing well on the shots that are coming off of a point but if they are getting up early I am missing. It seems like I am worst at the crossing shots. Not leading or following through. Only hunted Sunday this past weekend. I started out with my two English Setters. We were west of Hutchinson, MN. Started out at about 25 degrees and sunny which actually wasn’t too bad. Started out by seeing 4 hens grouped together. We continued to work around the edges of the field in hopes of pinning one there. We ended up pushing towards the drainage ditch. One Rooster got up a little ways out and I hit him but he dropped on the far side of the ditch. By the time we walked around the ditch to get to where it went down we could find him. We worked around the area for quite a while and still no trace. Tina and I worked that side of the ditch while Marge was holding on the other. As we pushed along Tina started to work a hot track. After about 50 yards she locked up. I kicked around and out up a Rooster. I thought I heard him drop into the grass along the ditch. I looked and couldn’t see him. Tina was searching and wasn’t finding any scent. I was starting to get upset and then I heard some splashing, Looking into the ditch I saw just the bird’s feet sticking up from the water. Tina didn’t see it and certainly couldn’t smell it. I ended up going in after him. The water was over my knees and dang cold. After putting the bird into the gamebag we worked along the ditch back towards Marge. As we closed in on Marge Tina started to get birdy again. We had one trapped between the two dogs. It was an easy shot and an easy pick up. Back at the Trailblazer I put the two dogs away and put on some dry socks and boots ( I usually hunt with spares of everything ) and took Fergie out for a nice workout just to stretch her legs. We put up a hen which was fun even though she can’t see them she still knows that something is / was there. It was quite a change in one week. Last Sunday it was 65 degrees and dusty, too warm to hunt the dogs for too long. This Sunday it topped out at 25 degrees. We were hunting just South of Hutchinson, MN. It is a 90 acre parcel. Mostly CRP with a good sized section of cattails. I started the two Setters and we worked along the fence line. When we got to the end of the field I was surprised to see that the corn was still up. It had snowed 2 days earlier and I could see a lot of tracks from the corn into the CRP. 4 or 5 hens were hiding in an area of thick short trees. As we worked around the thick cover we put up a Rooster. I got off two shots and saw him wobble after the second shot. He kept flying strongly towards the cattail section. We started to work towards where he went down. There was so much bird sign that it took a while to get back across the field. When we hit the cattails we worked the edge for a while. Tina went on point so I kicked and stomped in the likely area. No bird. I told her to go on but she held her point. She stuck her nose into the thick clump right in front of her. I heard and saw something moving. As the Rooster started to emerge. Tina almost caught it on the flush. I was able to bring it down on the far side of the cattails. We had to search for a few minutes to find it in the cover. The dogs kept working the edge of the cattails and came across some wet sections. Unfortunately the water wasn’t frozen over so they got pretty wet and when they came out the water started to freeze on their coats. Marge the 12 year old was starting to get cold so we headed back to the truck. I pit a coat on Marge and wrapped her up in a sleeping bag and put her in her kennel. We took a lunch break and drove around to see how much corn was still up in the area. After out break Tina and I headed back into the field. We worked for another 90 minuted and put up another half dozen hens but no more Roosters. The first weekend of November turned out to be a warm one. We drove out to the Dawson MN area to hunt a couple of new parcels. We started at a nice 80 acre CRP field. We got our first Rooster in about 30 minutes. The parcel borders a WMA and we were hunting right along the edge. I'm sure it had gotten pushed off by all of the pressure. We finished out the parcel with out seeing any more roosters. We moved to a small piece that bordered a drainage ditch. Didn't put up anything but the dogs were pretty birdy. The next spot was a large unit bordering a long drainage and a railroad track. We put up a fair number of hens but no roosters. The corn was still up across the road so I'm sure that had something to do with it. Decided to stop at the local DQ and get lunch and take a break. After the break we went back to the first spot again. As the sun was dropping we could see a pretty fair number of pheasants starting to leave the corn field across the road. We ended up getting our last rooster from the ones that had flown into the grass. I ended up cleaning the birds in the dark and then started the long drive home. On Sunday is was another warm one. We actually cut our hunt to about 90 minutes. We saw a few hens but no roosters. We were hunting near Hutchinson. Seemed like a waste to drive 2 hrs each way just to hunt for 90 min but the dogs and I were all feeling the heat. The plan was to take a Friday off and make a 3 day hunt out of it. Friday started well and we got 3 birds in a bit over an hour. We even passed on a few chances to fill out as we didn't want to be done right away. We were just west of Hutchinson, MN. We drove 90 min west to the Granite Falls area. We missed a couple of easy ones and ended up with the 3 birds. Felt ok about not limiting out though as it was misty and light rain to the hunting spots and from the hunt to the hotel but it was decent weather while hunting. Had good dog work out of all three dogs. Tina is starting to catch on to the ways of pheasants. Stayed at the Fiesta City motel... Pretty funny.. we had the cabin option. We got all checked in and headed down to the cabin. Walked in and it had not been cleaned at all. Went back to the office. Got switched to a regular room. $57 per night. Not bad for 2 guys and 4 dogs. Saturday was a nice day weather wise. We were hunting the Granite Falls area. Mostly saw hens until later in the day. Spots that usually produce roosters just held a few hens. Corn was still up around most of the spots though. Even hunted some public land for a change of pace and just saw hens there also. We did end up getting one rooster towards the end of the day. Missed 2 easy shots also. The dogs did well for the second straight day. I could tell they were tied by the end of the day though. Sunday dawned with howling winds. The gusts were up to 50 mph. We ate breakfast and bagged the hunt and started the drive home. When we drove by the spot we had planned to hunt it started to rain and the wet snow flakes were not far behind. Hunt 1000's of acres of private land in MN. 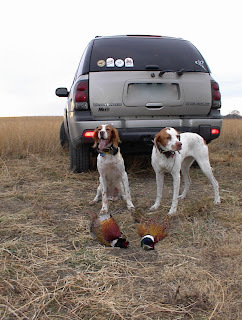 On Saturday I started out south of Hutchinson, MN and ended up getting one Rooster. I saw 2 others and 2 hens. The corn was still up on the south side of the unit. It was about 50 degrees when I started. I then drove out to by Sacred Heart, MN. I hunted 3 different units there and saw 4 more Roosters and 3 hens. I got a shot off at one of the Roosters but didn't get him. It was about 60 degrees when I quit at 2:30 or so. I was just hunting Tina by herself and she was getting warm and tired so I pulled the plug on hunting the late day hunt and decided to drive home early. Sunday I was west of Hutchinson and got my two Pheasants within about an hour. 2 nice points and relatively decent shots. I missed one that got up a little farther out. I'm glad I finished up when we did because it was up to 60 degrees already. So far I've been getting my birds with my 12 gauge Beretta. I usually swap out to my 16 ga Browning Lightning Feather after the first bird but so far I've either gotten my second bird during the first part of the hunt or I haven't been able to connect on a bird after I've switched. I'm seeing fewer birds this fall but so far the corn is still up around most of the areas I hunt. Today made yesterday all the more enjoyable. I hunted east of Albert Lea MN. Saw 1 Rooster and 2 Hens. It was just too warm and windy to be any fun. Corn was up on 3 sides of both of the parcels that I hunted. Hoping for cooler, calmer, and no rain for next weekend. The season got off to an iffy start. We were hunting just west of Hutchinson MN and due to Hwy 7 being closed west of St. Boni I ended up getting to my spot about 40 minutes after the start of the season. It wouldn't have been a big deal except that it was already 60 degrees and I was worried about it getting too warm if I had to hunt too long. Hunting too long didn't end up being too much of a concern. We got our 2 pheasants in about 30 minutes and got 3 more nice points on the way out of the field. Hunted the new setter, Tina, and mostly blind Pointer Fergie. Tina pointed the 2 birds that we took along with a pair of hens. Fergie actually had a lot of fun and ranged out a little ways and got a nice hen point. The Garmin Astro did a good job of letting me see where Tina was in the grass without having to use the locate feature on her Innotek Track and Train Collar. A US Solder, held in Iraq over 15 months longer than her original commitment to the Army, saved a puppy some months ago. The puppy was scheduled to be shipped out of the war zone to the soldier's parents in MN by Baghdad Pups, but the military seized puppy en route to the airport. Now the puppy might be killed to punish the soldier. Ratchet, The Dog, Confiscated by the Military, Soldier Devastate. Washington, DC October 1st - Operation Baghdad Pups is a SPCA International (www.SPCA.com) initiative created to provide medical care, clearance and transport for the animals our U.S. soldiers have come to love during deployment in the Middle East. Today, the United States military committed a crime against their own mentally wounded U.S. soldiers serving in Iraq. Commanding officers ordered the confiscation of a dog, Ratchet, befriended by a group of soldiers during a 15th month of deployment. Ratchet has been a lifeline to Sgt. Gwen Beberg. This morning, Ratchet was on his way to SPCA International rescue experts at the Baghdad Airport to be flown home to Gwen's parents in Minneapolis, MN when Sgt. Beberg's commanding officers ordered Ratchet confiscated and held in Iraq to face certain death. “This year has been extremely difficult on my daughter and her family. It has been a year of disappointments, loneliness, and fear because of all the sacrifices the army has required of Gwen. Ratchet was the savior of her sanity. Now they have cruelly ripped Ratchet away from her and sentenced him to death. I don't know how my daughter will cope. Ratchet has been her lifeline,” explains Sgt. Beberg's mother, Patricia Beberg. Gwen Beberg, a decorated soldier, has been held by the military more than 15 months past her original commitment due to the stop-loss policy and now the military that asked extraordinary sacrifice from her has crushed her by ripping her lifeline away. Now, Sgt. Beberg is under military investigation for befriending the dog that saved her life. It is against military regulations for active duty troops to befriend animals - Soldiers can face immediate court-marshal and some even see their animals brutally murdered by a direct gunshot to the head from commanding officers who will not bend the rules. Hundreds of U.S. soldiers in the Middle East befriend animals in the war zone to help themselves cope with the hardship and terror they face every day. These dogs and cats become their lifeline - saving them from deep depression and Post-traumatic Stress Disorder (PTSD). The military refuses to help or formally recognize the lifeline these animals give to our mentally wounded soldiers. Veterans returned from Iraq are committing suicide at twice the rate of average Americans. The dogs and cats befriended by our troops rescued by Operation Baghdad Pups are providing proven pet therapy to soldiers who may otherwise suffer from PTSD and deep depression. This past weekend I was hunting by Ely, MN. I've hunted up there at least one early weekend for the past 10 years. On Saturday I saw / heard 8 birds, shot at 2 and got both. I started with my new Setter Tina ( http://www.hunt.mn/tina.htm ) She has been used as a Guide Dog on hunts before. I was nervous that she would run way to big for me. She actually was about right. I think that if a few more of the leafs had been down we would have been a good match. She got 1 of the two birds. Marge and Fergie were hunted together. Marge is a 12 year old English setter and still can hunt far a good period of time. Fergie is a 10.5 yr old Pointer who is mostly blind. She seems to see somewhat when it is sunny outside and enjoys going down the trails and taking her time through the woods. They did well and we got one bird on the hunt. Marge did end up running off, I'm guessing that she was chasing a deer. She got out to 700 yards. I ended up getting my truck and driving back to where she had taken off. She actually came back and was hunting the other side of the trail. I was using the Garmin Astro on her for the first time and was really pleased with how well it worked. Sunday wasn't as productive. We only saw one and heard 1 other bird. We ended up calling it a day around 2 pm so that I could make the drive back to St. Paul. Coming Soon - Reviews of hunting gear that I am actually using. My Garmin Astro arrived this weekend. I wanted to get one last year but held off while hoping for an upgrade dunit this year. The new dog collar portion looks way better than the unit they had last year. Hopefully I'll get a chance to try it this coming weekend while chasing grouse. Just hoping for good weather. I'll post an update as soon as I have a chance to use it. Picked up a new dog last Sunday. I looked at a lot of options and she looked like a good fit for us. Both of her parents are Coverdog Champions and she has been used guiding for grouse and quail. I'll have to get her used to Pheasants as soon as possible. Excited for hunting season to hit full stride. Actually looks like it might be fairly warm this weekend so might skip hunting and get the house chores done.